Paola Cimarosti is a magic Italian lady…she moved to Egypt fourteen years ago, and today she happily works as a Spiritual and Energy Healer, and much more. We thank her for sharing her story. You moved to Egypt and followed your inner voice and passions, creating a whole new career, right? Actually I have to say that I came to Egypt for a “mistake”. My destination was supposed to be Bahia. Then life took over as only she can do…a few changes..a mix of coincidences and…I ended up in Sinai. It was 2004. The plan was to stay for just 14 days, but after 14 years I’m still happily here. The seeds of my career were already in me at childhood. I was born with a “special package”, which I considered very normal. It was when I became a teenager that I realized that something in me wasn’t so… common. Since then I have been passionately researching and studying how to properly use and develop my innate healing and channeling talents. It is an amazing endless personal growth path whose outcomes I love to share with those in need. My professional carrier began in 2001 when I followed my inner voice direction. I quit my job in PR to devote myself only to Pranic Healing sessions. Despite landing in Egypt with some years of professional practice already behind me, it was not easy to integrate my profession into the Sharm el Sheikh of the “golden times”. People were after more superficial enjoyment than an inner sight. Sometimes I combined healing and yoga activities with some more materialistic jobs both for financial reasons and out of my need to stay anchored to more concrete aspects. Sensitive and spiritually very active persons can be easily taken away by Sinai and it is important to develop some strong roots as well. What have been the steps to make yourself known and to have a sufficient flux of clients? Sharm as well as Sharmers keep changing. Every few months somebody new arrives and many leave… Workwise it is hard to cope with this fast turnover. You have to constantly start from the beginning with most of your students or clients. It is a crazy loop that demands a lot of inner stability, big passion and strength. I think that together with talent and professionalism these are the main aspects of a successful career. Clients’ appreciation and word of mouth are vital too, even more than any marketing strategy. It’s also for this reason that I’m endlessly grateful and respectful towards all the people I had the pleasure to work with. What have been the main challenges in working in Sharm, or Egypt in general? Apart from the high clients turnover, I would say the indirect communication, which is typical here. I’m a quite straightforward person and having to decode what somebody really means when they say the contrary of what they are thinking, presuming that you understand between the lines…just explaining the concept makes me dizzy! But I have to admit that at the same time it has been a quite interesting school. You also do “desert therapy”: can you explain what it is? Desert Therapy is one of the many gifts I received from Sinai. It is a soul trip down to its roots. A highly personalized program of Meditation, Yoga & Self Healing combined with Sinai Desert’s healing properties. Hosted by a local Bedouin community we travel back in time through traditions, music and legends. Embrace the slow rhythm of the desert life. 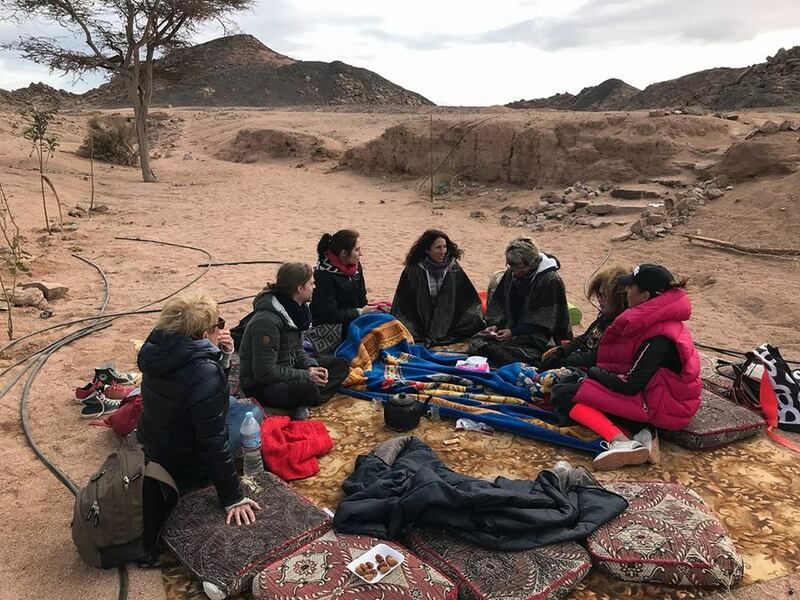 Hike, exchange with old and new Bedouin generations, taste traditional food and free our minds while watching the fire with a cup of tea in our hands. We sleep under millions of stars. Dream. Melt with the Universe. It a is highly purifying, healing and re-bonding experience. Awakening the souls to the earth, the sky and humankind’s roots, when we were one with ourselves and the nature. When life and time were counted by events, not by numbers. Tell us about your Reiki workshop of 21st September in Cairo. Thank you for asking about it because this will be a really interesting and unique course. Reiki is an ancient energy healing method. Very easy to learn and at the same time very safe and powerful. 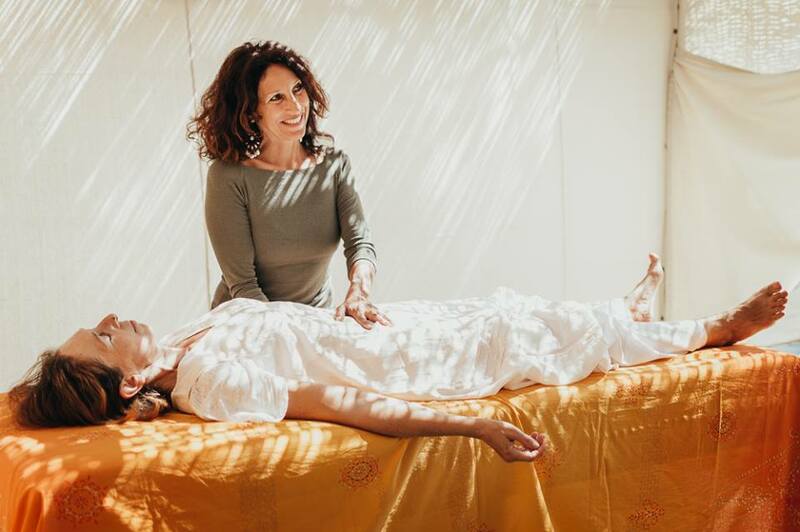 In this level 1 course participants will be guided to discover their natural healing power, perform a proper self healing session, learn how energy healing works and all the ethical related aspects. The ethical topics for me are a quite important point. I have noticed how more and more people, including colleagues, use their spiritual knowledge inappropriately. They often do not consider the implications of what they do. This is why I decided to dedicate a specific space in this Reiki 1 Course to this topic. This Universal Spiritual Law was brought to the big public by a massive marketing operation more than 20 years ago. They widely explained what it is and how to use it to get what you want. But they “forgot” to mention the ethical and karmic consequences of it. Basically its spiritual aspects. For many years I’ve been witnessing people paying the consequences of this irresponsible operation. I see people complicating their karma, losing faith in the Universe, developing paranoid patterns and, even worse, strengthening their own inner wounds until getting into a deep depression. This is what has not been said and brought to light. In Egypt this phenomena is still relatively fresh and there is a big margin of intervention to prevent, inform and guide people towards a responsible use of certain “toys”. Of course all this requires a huge amount of humility and wisdom exactly like the Law of Attraction does. For all this, on September 21st I will combine a mature approach to energy healing with the study of the Law of Attraction and its responsible use. It will be a life changing experience generating wiser and more powerful Reiki practitioners and humans. The Course will be in Maadi, Cairo from 10am to 6pm.